Helen is an equine podiatrist and advocate for hoof health (www.muddyhooves.net). 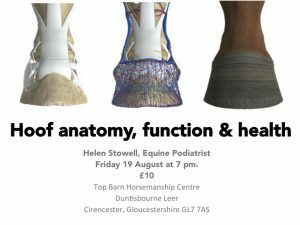 Her talk will look at the functional anatomy of your horse’s lower leg, highlighting why hoof health is fundamental to long term soundness. Anatomical animations. models and real life case studies will give you a new found appreciation for the amazing feat of nature that is your horse’s leg.